Maximum likelihood estimation (MLE) is a popular method for parameter estimation in both applied probability and statistics but MLE cannot solve the problem of incomplete data or hidden data because it is impossible to maximize likelihood function from hidden data. Expectation maximum (EM) algorithm is a powerful mathematical tool for solving this problem if there is a relationship between hidden data and observed data. Such hinting relationship is specified by a mapping from hidden data to observed data or by a joint probability between hidden data and observed data. The essential ideology of EM is to maximize the expectation of likelihood function over observed data based on the hinting relationship instead of maximizing directly the likelihood function of hidden data. This tutorial aims to provide explanations of EM algorithm in order to help researchers comprehend it. 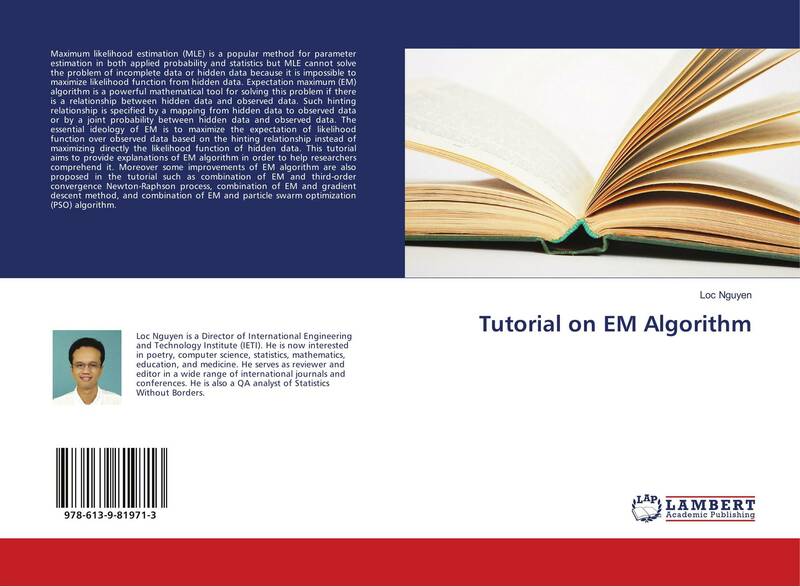 Moreover some improvements of EM algorithm are also proposed in the tutorial such as combination of EM and third-order convergence Newton-Raphson process, combination of EM and gradient descent method, and combination of EM and particle swarm optimization (PSO) algorithm.